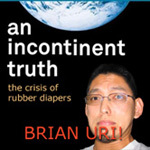 There are no major spoilers in this review. At its heart, Diablo 3 is a manifestation of the slot machine principle: you run around killing monsters by clicking on them, and get showered in gold, gems, and magical loot. Occasionally, an amazing piece of armor or a weapon will drop, powering you up for harder fights and ensuring that you want to keep playing in search of better loot. Diablo 2, the ultimate time-wasting game released 12 years ago, was a huge success and attaches high expectations and baggage on its sequel, but this new game stands strong on its own. There are parts which could have been done much better, but nothing that takes away from the sheer fun and addictiveness of the core gameplay mechanics. At the time of writing, my primary character is a Level 45 Demon Hunter in Act II at the Nightmare difficulty level, although I have played the other four classes (Barbarian, Monk, Witch Doctor, Sorcerer) at least to Level 11. This is definitely an evolution of the Diablo series, which is a good thing. The game design plays it safe, refining many of the annoyances of the older games without introducing anything that completely changes the genre. (When Half-Life came out, I was bored to tears because I really just wanted to play a new version of DOOM). All of the character classes feel fun, viable, and have a nice sense of progression towards unstoppable power. The handling of potions and life / mana regeneration makes battles slightly more strategic, and the character stat pages have all the numbers and clear descriptions you could possibly want (although you can have just as much fun ignoring the numbers under the hood). The biggest change in gameplay is the elimination of skill trees and point allocation. In games like Diablo 2 and World of Warcraft, you earn points at each level which you can then spend to get better at specific skills. This system required much planning and research to ensure that you didn't make an irrevocable stupid mistake, and I was weary of starting every Diablo 2 game by looking up builds on the Internet. 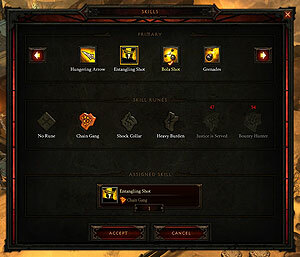 In Diablo 3, there is just a big bag of skills with various modifiers. You eventually learn every skill, and you customize your character by picking out your 6 favorite skills. You can swap out your skills with minimal penalty, which really encourages experimentation and natural growth. I'm onboard with the change, and would become a Fan of it on Facebook if it were a celebrity and if becoming a Fan actually meant anything. The game has four levels of difficulty, and the challenge feels about right so far. Normal mode is sometimes tricky, but never so demanding that you're afraid to experiment with your build. Nightmare ramps up nicely so far, and feels difficult without feeling frustrating. Every map is randomized each time you play, and I continue to stumble across little random events that I hadn't seen before. The style and tone of the game are very well done, and the graphical look is perfect. I have a 2010 vintage graphics card (aged in oak) and the framerate is rock solid in all but one dungeon (which has lots of water effects). Skills look and feel progressively more powerful, and the music easily walks the fine line between ambient garbage and being too melodically recognizable. The voice acting is solid, though the little quips that are humorous at first can get noticeably repetitive. I don't care much about speech anyhow, since I read fast and click impatiently through walls of text. The game's main plot is the MOST INCREDIBLE STORY EVER to win third prize in an elementary school Reflections Contest. It's eminently forgettable, and the dialogue is often laughably bad, as if it were all written by an English major (that failed out and switched to business) who was told to write a haiku using only eight syllable words. This doesn't matter though, because the lackluster story doesn't make the game any less fun -- it just means you can safely ignore almost all of the plot and go about your business of killing monsters. A noticeable flaw in Diablo 3 is the user interface, which was obviously designed by the same guy who thought it was a good idea to make the text next to ATM and gas pump buttons not actually line up with the button being described. The UI is overly busy, insisting on holding your hand through each quest and informing you of the most mundane details that don't really matter. Every alert is flashy and animated, and popups litter the screen like a Punch the Monkey website from the late 90s. It can be very distracting to play with all of these notifications firing, similar to reading online articles on websites that insist on putting automatically updated Twitter feeds next to the prose. You cannot turn any of these annoyances off, and it is very easy to miss the information that matters, like which new skills were just unlocked when you gained a new level. The skill UI is intentionally obtuse, to make it so you cannot easily switch your 6 skills in the heat of combat (and making a UI worse to prevent an action perceived as harmful has never been a successful design principle). Turning on "Elective Mode" is a must, so you can select your 6 most useful skills, but even then it can be hard to see the big picture of your full skill set, since the skills are spread across six separate pages in the UI. A list approach to this aspect, with all of the skills on a single drag-and-drop page, would have been much more intuitive. 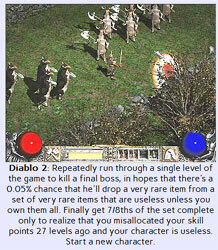 Diablo 3 is designed as a client/server game, where the guts of the game are actually running on Blizzard servers, and the part installed on your local computer is just used to render the graphics and let you click on stuff. There are definitely solid technical reasons for this approach (preventing cheating, ease of hotfixes, etc.) but undeniably and without caveat, it's a stupid idea to require an Internet connection to play a single-player game. I'm lucky enough to have a fast, consistent connection, and have had minimal problems with the servers after the Launch Day debacle, but I would still prefer to just be able to fire up the game locally without having to deal with lag and logins. So far, this is not enough to dampen my enthusiasm for the game, but it's something to take note of. Blizzard's online environment, battle.net, has not improved in the least bit since my Starcraft II review in 2010. Blizzard's attempt to transform gaming into a social venture is awkward, like Google thinking that Plus will catch on if they just integrate it everywhere. For me, gaming is primarily a solo endeavor, and sometimes I just want to play a game without talking to other gamers or inadvertently revealing that I played Skyrim for 160 hours in the last two months of 2011. I would mind battle.net much less if I could go "invisible" or have some privacy control over what details are available to friends. The final piece of the online puzzle is the Diablo Auction House, where you can buy weapons and armor for in-game gold or real currency. I would strongly recommend not buying from it, because it defeats one of the primary joys of playing the game: what sense of elation can you possibly get from an amazing prize that randomly drops in the game, when you know you can just obtain better gear more easily and with less of a time commitment in the auction house? The gear for sale from other players will always be better than the gear you get in the game (sometimes 2 and 3 times as good) because of the way minimum level requirements work. For example, the best sword you can use while at Level 9 would not actually drop in the game until you are Level 15, but you can immediately buy it at Level 9 from other players who are further along. 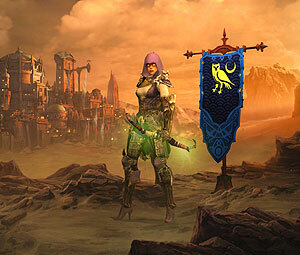 Just use the auction house for selling your old gear and your playtime will be a little more fun. 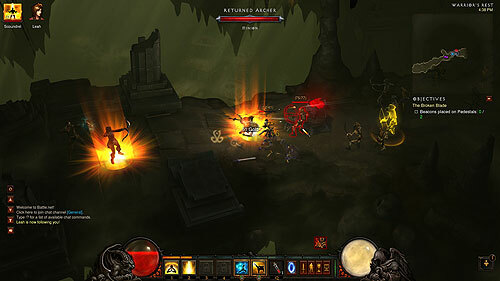 Diablo 3 is well-polished with a ton of replayability, and can be enjoyed with or without prior knowledge of the series. If you don't mind a kludgy skill interface and the always online requirement, this is a solid purchase. Next Post: Random Chart Day: Remember LOST?